The Acer Aspire V5-122P feels like a notebook the Taiwanese company just dashed off between high-profile Ultrabook launches and, as such, is hard to recommend. What could have been a highly-portable touch-enabled work laptop is undone by a poor battery and some ropey usability issues. 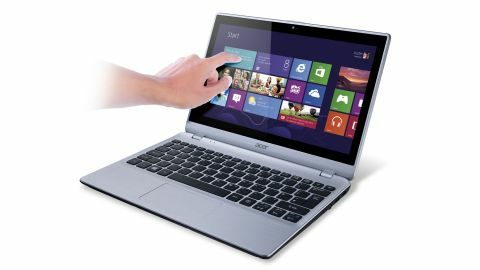 The Acer Aspire V5-122P tries to be all things for all users but, in doing so, doesn't stand out in any particular area and largely falls short of other options like the Lenovo IdeaPad Yoga 11 or the Asus VivoBook S200. For example, the 1.3kg, 11.6-inch chassis is light and very portable which would make it an ideal option for frequent travellers. But the battery life is so poor that you'll struggle to get a solid two hours of use from it. Likewise, the keyboard is sturdy and spacious and great for typing on - but unfortunately the equally spacious trackpad is awkward and unresponsive. Acer has somewhat remedied this by giving the V5-122P touchscreen input and, as such, it works very well with Microsoft's Windows 8. You won't need to navigate using the touchpad's frustrating integrated click buttons because you can just reach up and swipe through options on the screen. Although available in a wide range of specifications, our review model arrived with an AMD A6-1460 processor with a clock speed of 1.0GHz and backed by 4GB of DDR3 RAM. While these components handled complex processes well on day one, we're not sure how well the V5-122P will hold up after a year's worth of program installation and software updates. And yet, this middling specification does land the Aspire V5-122P with the not-unattractive asking price of £380. So, as long as you're happy to compromise on a few features, you can save yourself some cash over the likes of the HP Envy x2 or the premium Sony Vaio Duo 11. But, returning to our original point, it's not exactly clear what you're going to be using this laptop for anyway. The display is passable but certainly not built for media. The specifications will keep the basic web applications running nicely and let you run simple creative software, but don't expect to be gaming or editing HD footage. And, as we mentioned, it's portable enough to be a mobile workstation but the battery life lets it down. The Aspire V5-122P comes across almost as a supercharged netbook. You could well find a use for it but, ultimately, there's nothing you can't do here that couldn't be accomplished with an Ultrabook and, for example, Microsoft's recently price-cut Surface Pro tablet.